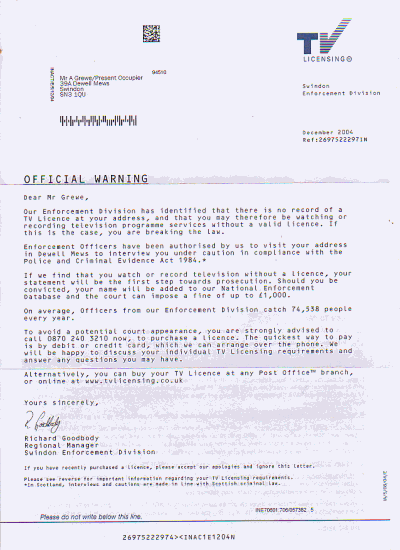 Ministry of Propaganda - 11/Dec/2004: "Enforcers = Paper Tigers?" Something makes me think the people from TV Licensing are just paper tigers. They recently sent me an OFFICIAL WARNING, now about a month later they sent me ... another OFFICIAL WARNING. Only difference being that this time the letter is from the Swindon Enforcement Division. Our Enforcement Division has identified that there is no record of a TV Licence at your address, ... Now there's a surprise, I guess your records show that for more than a year now? After all you've been telling me this for more than a year? Enforcement Officers have been authorised by us to visit your address in Dewell Mews to interview you under caution ... Erm, yes, as they have been a month ago. None has surfaced as yet. Is it too cold for them? Can't they get out of their cosy offices? Or do they only exist on paper or as avatars on your screens? To avoid a potential court appearance, you are strongly advised to ... purchase a licence. To avoid wasting more time with pointless letters I strongly advise you to get out of your cosy offices, drop in at Dewell Mews (it's a nice road, not much parking though, so you better come on foot), so that we can establish that I don't have a TV. I won't ask you in and offer you a cuppa and some biscuits, but the staircase is a nice enough place to settle this.